My RBG prints are in and I’m super excited about them! They are 11”x14”, Limited Edition print of 100, signed and numbered on Hahnemuhle Heavyweight Matte Fine Art Paper. The first 10 orders come with a free RBG Vinyl Sticker! Hop on over to my Store to order yours today! I had the good fortune of being included in a recent show at the Davison Art Gallery at Roberts Wesleyan College. I was given the opportunity to share the space with artists’ Nate Hodge and Richard Nickel. The concept of the show was our relationship to home, and the ways in which we occupy the space. Here is a short video of the show. Enjoy! I love driving at night. Somehow, the combination of night and movement brings clarity to my thoughts. I love the comfort of singing along to the radio in a blanket of darkness while looking at the illumination of the passing houses; the staccato of interior lights serving as a beacon for the energy that dwells inside the walls. Seeing the houses lit up from within, I often wonder about the lives of the people who occupy them. Is it a family who lives there? Are they happy? Are they going through a divorce; a new marriage, taking care of a dying loved one, or planning their next family vacation? Is it a single person? Are they feeling lonely; fulfilled; lost? How do the material items occupy the space? Is it clean, or littered with items they just can't seem to part with? With these thoughts in mind, I have started to explore a new focus in my work towards the idea of the home as a sanctuary of contradiction in our lives. The home serves as a familiar space, often filled with both tangible and abstract items that remind us of love and loss, secrets and memories. How each of us dwells in those spaces is what interests me most. We build relationships with not only the people we share our space with, but the space itself. Those relationships we build with objects can be just as complicated as those we build with people. I'm interested in the connection between the order and chaos, and the relationships and walls we build to both grow closer and push apart those we love. I feel like this concept is really allowing my use of patterns to grow from a design choice to more of a conceptual choice. I'm interested in the connection between order and chaos when it comes to patterns, and how their beauty and breakdown can be a symbol for the lives we live inside our homes. Sometimes, we portray order while we are hiding chaos. I'm excited to explore this idea further. I've been experimenting with various materials this time around, mixing it up with some ballpoint pen and even (gasp!) oil paint. I am enjoying the process of growth and learning, pushing myself outside of my comfort zone and into that weird place artists dwell: (un)certainty. Sometimes, I have no idea what I’m doing when it comes to my art. It’s not to say that I doubt my ability with the materials I use; well, I do that sometimes, too. But really, it’s more to say that my vision when making a piece is often murky at best. My ideas often come from a question I have been mulling over. The question is like a seed of an unknown plant; I bury it in the soil, tending to its needs and wondering what will grow. The seed starts as one question, but as the ritual of waiting to see what sprouts grows momentum, more questions rise with the bud to the surface of the dirt. What have I planted? Is it hearty enough for this climate? Will it be a tree that lasts for decades, or a plant that lasts a season? Will it spread? Will I even know what it is once it grows? Will it be beautiful? How do I define beauty? Like the mystery seed, the question I start with at the onset of a piece is often small, yet powerful. One question leads to another, and before I know it I’m asking more questions than learning answers. And this is my process. Question, question, question. I just finished a piece that asks more questions than it provides answers. What importance does spirituality have in our lives? What is the correct way to believe and practice? Why should we believe? How do I know what I believe is true? How do I recognize a higher power in my life? Who has the ultimate control? Why does this even matter? Despite the 35 hours I put into completing this piece, my colored pencils just couldn’t work out all the answers. However, like the seed germinating beneath the soil, sometimes the process of questioning is more meaningful than learning the answers. Sometimes, it’s the questions we ask that tell us more about ourselves than anything else. Blind Faith | 2017, Prismacolor and Caran d'Ache Luminance Colored Pencil, Pan Pastel, Le Plume Maker on Strathmore Artagain Grey Paper. Reflections on my solo show: a thank you. I’m feeling frustrated by my lack of ability to coherently put into words just how much it meant to me to have my solo show, (DIS)CONNECT, this past month as the Makers Gallery and Studio. It seems like the blinking of the cursor is mocking my inefficiency of the English language, slowly ticking away my confidence with each flicker, reminding me that sometimes my greatest challenge is crafting words, not images. Yet still, I will try. At my deepest core I am just thankful, thankful for the opportunity, and thankful for all the people who took the time to come see my drawings. I find the process of putting my work out into the world to be both rewarding and terrifying, a slow cooking mixture of contradictions that stirred my confidence levels between low and high. My work draws upon a lot of personal narratives, and exhibiting my work removes the proverbial confidence mask to reveal a vulnerability I don’t normally share in everyday conversation. Yet, I’m also proud of the work that I made in the past two years, appreciative of the journey I took to create it and the outcome of seeing it displayed together. So, thank you for sharing my journey with me, whether it was as a fellow artist who I bounced ideas off of, or a gallery for giving me an opportunity, or as a student who posed as my subject matter, or a friend that listened to my anxieties and triumphs for two years, or as a person who showed up to see my show at the conclusion: thank you. My journey isn’t over, but my destination is changing. After spending a lot of time exploring the human figure and the precarious mental state of the individual in my work, I’m refocusing my subject matter to the concept of the home as a sanctuary for memories and secrets. I’m really jazzed on this new series and inspired by the steady flow of ideas coming my way. I hope you can continue to be a partner in my process. For the past two years I have been at work on a series of drawings. When I started, I didn’t know what the series was for, or even about; it started as a journey with no end point. It was born as a way to make sense of the daily encounters and connections I had with myself and others; a need for a visual memoir of sorts. As time progressed, my journey began to take shape, my path made more clear, and my endpoint more defined. This ending as led me to a solo show of my work at Makers Gallery in Rochester, New York. I am really excited and proud of this body of work, and would love to see people there at the opening to celebrate! I've been thinking a lot lately about the concept of emptiness. Emptiness can be nice; take for instance when my son's floor is clean of his mountain of toys, or an empty to do list. But, emptiness can also be haunting. Emptiness could be felt in a relationship, an occupation, or in oneself. It can be the outcome of something that has once brought you fulfillment, or the reason that you feel invisible in a room full of people. In this piece, I tried to tackle the idea of emptiness, like a void splitting oneself in two parts. The parts no longer fit together congruently. Instead, one may try precariously to fill the void with the choices they make in hopes of feeling whole again. I may continue exploring this theme in my next few pieces. We'll see. I've been having so many different ideas lately that my sketchbook is full of messy drawings, but I work so minutely that it's difficult to see them all come to fruition in the time I would like. In any case, I'm loving the balance of the Prismacolor Colored Pencil and PanPastel I've been using, so there will definitely be more of that. Into the Void 19"x25" Prismacolor Colored Pencil, LePlume Marker, and PanPastel on Strathmore 400 Series Gray Paper. When I was young, my mother would always listen to The Monkees. She would put her tape in the car cassette player as we made our way to our destination, unabashedly singing the lyrics slightly out of tune. Their songs found a way into my psyche, nestled between a nostalgic fondness of WWE wrestling and Yorkshire Pudding. Years later, there will be times that I find myself involuntarily humming their tunes while driving or washing the dishes, like a whisper of nostalgia. I always liked the song Daydream Believer. It's simple prose is both catchy and thought provoking. I loved how it told the story of a woman who dreamed of a better life despite her reality. It's a familiar concept, and yet so hard to achieve in the face of struggle. In this piece, I sought to explore the idea between the push and pull of dreaming. Daydream Believer | 18" x 24" Caran d'Ache Graphite, Le Plume Alcohol Markers, Caran d'Ache Luminance Colored Pencils, Charcoal, and Gilding Paint on Strathmore 400 Series Paper. My father died in a complicated way after a complicated relationship when I was 19. For years, I have struggled to come up with a composition that I felt would tell his story in an adequate way. It felt like too much pressure coupled with too many emotions. 16 years have past and I finally felt at peace enough to tackle this subject matter. My father was a man conflicted with demons of his own making. A lone wolf who was constantly on the move searching for peace, but falling short with each new town and relationship he entered. At his core, he was a good man. I will forever believe that. He had a tough childhood, spent his early adulthood serving in Vietnam as a Sniper, and spent a lifetime battling mental illness. I wish he would have sought help. I bet he could have been a really great father, but mental illness isn't fair and doesn't discriminate. I can remember my mom explaining it to me when I was little, saying that he had a cloud in his brain that made him not be able to make good decisions, and do and say things that didn't make sense. I like to think he is at peace now from his demons and looking down on me from a cloudless sky. Dad | 18" x 24" on Pine using Prismacolor Colored Pencils, LePlume Alcohol based makers, and Gelly Roll Gel Pens. There is this great show hosted by Nazareth College (my alma mater!) in which high school art teachers are invited to show a piece of their work alongside a piece of their student's work. The participants usually take one of two approaches: create two separate pieces that are independent of one another in concept, or create two pieces that relate to one another in some way; a diptych of sorts. I love the tie and take of collaboration, so my chosen student and I decided to tackle the later. After watching me work through the crystals on my last piece, my student, Casey, wanted to try some as well. We talked through concepts and discussed symbolism and materials. True to Casey's artistry, she chose to create a humorous depiction of herself as a "magical narwal with a necklace of crystals", while I chose to stick with my theme of exploring overcoming anxiety. We unified our pieces with colored pencil and pattern. The result was made me proudly happy. I am so thankful for the opportunity to be a high school art teacher. I love that I am able to work with students like Casey for four years; to watch their progression from student to artist, and to build a relationship of mutual respect that allows for collaboration such as this. Anxiety Beehive | 11" x 14" Prismacolor Premier Colored Pencil, Le Plume Alcohol Markers, and Gilding Paint on Strathmore 400 Series Grey Toned Paper. I've completed another piece in my series and I'm loving three things: patterns, gilding paint, and crystals. I've always struggled with how to handle my negative space in drawings. I've often just left it blank or shaded with graphite powder which is feeling pretty boring these days. I've been thinking a lot about this approach lately, and decided to push my ideas and incorporate more patterns in my work. I think I've been drawn to patterns, especially the honeycomb pattern, because it reminds me that beauty can be born from chaos. This is an idea I like to live by when I look at my messy house, piles of laundry, screaming kids, and half finished drawings; beauty may just be lurking under that week old sandwich left in my son's room. Maybe. This piece was my first go at ever drawing crystals. Their intricacy was rewarding and I enjoyed that I didn't have to stick too close to my reference. I will revisit them as a subject soon I'm sure. I'm also still loving the gilding paint. I love how it transforms the drawing depending on the light source. I can't get enough of it for now. This piece was completed on 19" x 25" Strathmore 400 Series Toned Grey Paper, with Prismacolor Colored Pencils, Le Plume Markers, and Martha Stewart Gold Gilding Paint. I completed another piece in the new series I'm working on. The series itself seems to be moving fluidly in many different directions, and I hesitate to define my ideas rather than just enjoy the creative journey and let them come out organically with time. On a side note, I'm so thankful I have so many awesome students who are willing to be my models and humor me and my weird ideas. Being a high school art teacher has a lot of perks, and the endless supply of people willing to let me use them as subjects is certainly one of them. The bird in this drawing is a Cuckoo bird which has engaging symbolism. It is known for its tendency to be brood parasite, because they will lay their eggs in the nests of other birds. Their chicks will then hatch and instinctively knock the other eggs out of the nest. They are tricky little jerks, that's for sure. Cuckoos remind me of the beautiful, yet savage moments of trickery in life. One thing I loved about making this piece was the use of the gilding paint. It's my new favorite obsession right now. I love the way it changes the dimension of the piece depending on what direction you are viewing it from. It gives the illusion that the drawing is in a constant state of change, an ebb and flow to its story. This piece is 18"x24" and completed with Caran D'Ache Graphite, Martha Stewart Gilding Paint, on Strathmore 400 series paper. As an artist, I find myself constantly trying to evolve and push myself with new ideas. I see my work as a journey of concepts, and lately I have been feeling the pull to explore new ideas dealing with women and nature. I hesitate to say mother nature because that theme is a little contrived, but it does serve as an easy synopsis for now. In any case, I finished this piece a few days ago, and I really like the direction it is leading me. This piece is 19" x 25" and completed in Prismacolor Colored Pencils, Copic Marker, and Gelly Roll Gel Pen on Strathmore 400 series Toned Tan paper. One of the things I love about being an artist is surrounding myself with other artists. I love the give and take of ideas and the ability to connect with someone else on a creative level. It's therefore pretty advantageous that I happened to marry another artist. Ironically, despite our romantic union, we have never collaborated together on a piece before. Our working process and style come from really different places; I tend to be tight and methodical while Rob is loose and chaotic. I have always liked our contradicting approaches, as if his work is the yin to my yang. We were given the opportunity to conspire together in a really interesting show at The Makers Gallery this month. The premise of the show was for artist couples to create a diptych; two pieces of work meant to be shown and hung together as one. The creation of our work turned out to be an adventure in cooperation. It was actually easier and more seamless than I thought It would be. Our concept came about rather quickly: since it was a work completed by a couple, we decided to make the piece an analogy of our relationship. 7 by 3 feet in total, the piece is unified through color pallette and pattern, though the styles are very different. The triangle, the strongest shape, symbolizes our marital strength. Rob portrayed me as fierce yet gentle, while I depicted him with a blue jay: a loud and protective bird that is with its mate for life. Working together proved to be an adventure, and a good one at that. Rob's piece is 5' x 3' Acrylic, pen, and collage on canvas. My piece is 2' x 3' Prismacolor Colored Pencils and Copic Markers on Strathmore 500 series paper. Every six months or so I like to create a portrait of my children. It's my way of capturing their spirit outside of the conventional pictures, as if in the act of drawing them I can somehow cement their childhood character into my memory more effectively and with greater retrospection. In the past, my work of them has been more traditional; usually, their faces fit the full frame and the negative space was often left muted. I wanted to push my composition this time in an effort to not only capture their faces, but also their fleeting childhood. The image of my daughter, Harper, is from the first snowfall this year, when she had to stop and pause in the middle of a parking lot so she could catch a falling flake on her tongue. I was in a rush that day and a somewhat annoyed with her delay, but seeing her face turned up to the sky attempting to catch the snow between giggles made me pause, and reminded me to appreciate the small moments of simple happiness. She is symbolized as a Goldfinch; a small and skittish bird that can be both curious and cautious. The body of the bird curves around the contour of her face, guarding her innocence. The tulips on the bottom are the flowers that are always in bloom on her birthday; they will forever remind me of those first few weeks of motherhood when I felt so full of love, yet so clueless. (I still feel this way most of the time.) Finally, of course there are her hands. A miniature version of my husbands, she is holding a butterfly with an outstretched finger on the right and reaching her hand forward as if to present her brother in the middle. And then there is my son, Bennett, dressed up as The Flash with his familiar spirited expression. Usually wearing some type of costume, either as a superhero or Star Wars character, Bennett is known for thrusting himself into any conversation with imaginative play. While his affinity for interruption can be annoying, I appreciate his eagerness... most of the time. He is represented as a Cardinal on the move, a bold and outgoing bird. His two hands on the top are flanked by peonys, the flowers that are in bloom when he was born. The last image is the onlooking owl, representing my husband and I as we wisely (or a least the best we can!) watch over them. I like my art to always invoke a memory, like a organized snapshot of a jumbled set of feelings. This drawing was more a labor of love than anything else, taking me just around 40 hours to complete. This drawing was completed on 18"x24" Canson Bristol Paper with Caran d'Ache graphite pencils. It's no secret to anyone who looks at my work for more than 10 seconds that I tend to be very tight with my mark making. While I enjoy the look of loose lines and broad strokes from other artists, I struggle to do the same in my own artwork. After wandering through our local art store this past weekend I stumbled across an interesting new material I had never seen before called graphite putty. Made by ArtGraf No1, the putty is malleable, can be used dry or wet, and is beyond fun. Nonetheless, I squeezed it in my hands and went for it; no planning of ideas, no preliminary sketches, just intuitive mark making. The creative flow took over, that sweet spot as an artist where decisions are made effortlessly and quickly. 20 minutes later I created a piece that was so outside my norm it made me smile. I love the texture the putty creates as well as the saturated blacks. It's definitely a material for finding that artist flow. 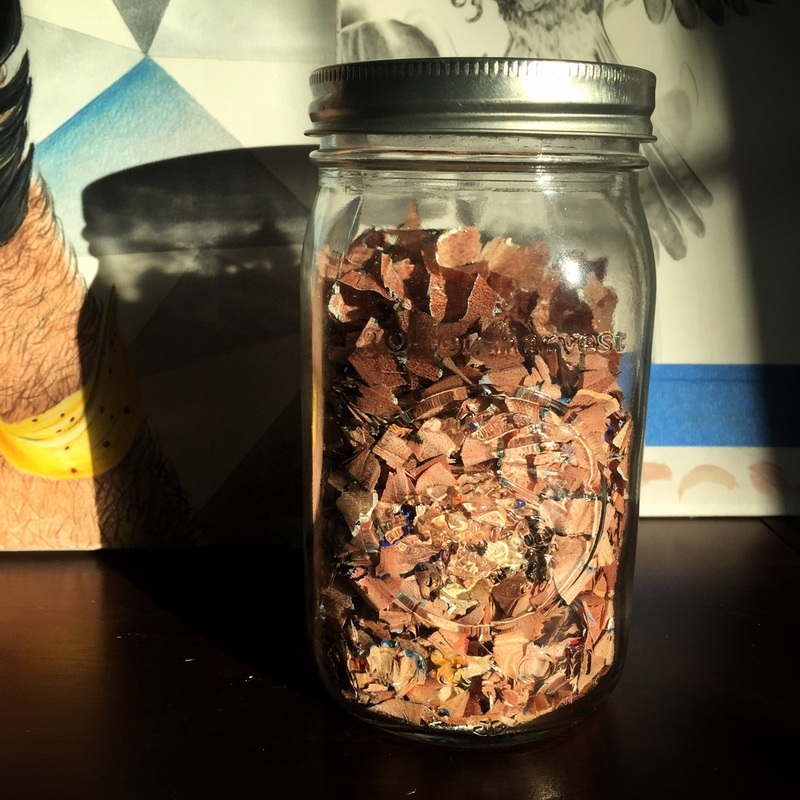 Pencil shavings: time and ideas in a jar. This jar holds all my pencil shavings from my last piece, which is essentially my work from all of January. I have this habit of saving all my pencil shavings in mason jars with no real plan as to what to do with them. I can't bring myself to part with them because I love the symbolism they hold. It's as if all my hard work, my mistakes and certainties, my creativity and ideas are bottled up on the desk in front of me. They are such a good reminder that with hard work comes progress. I have this fuzzy vision of showcasing them next to my completed pieces, as if the time and effort it took to create the piece is visually tangible. Of course, they will probably remain in my bookshelf, next to my middle school diaries and collection of old photos, my idols to time spent, but it makes me smile to know they're there. I'm embarking on a an adventure in size. I usually work at a reasonable size that hovers around 11x14, but I have been given the opportunity to create a piece of art with my husband for an up coming show and I decided to essentially go big or go home. I will touch more in the show and the meaning behind my piece once I'm done. This piece is 24x36 and will be completed entirely in Copic markers and Prismacolor colored pencils. While the larger size presents new challenges, I am loving that it allows me to really seek out all the small details in the hands and bird. I tend to get lost in details, so this is really becoming an exercise in patience for me. This is the last bit of guidance Yoda gives Luke as Luke attempts to raise his X-wing from the swamp after he has crashed on Dagobah. In essence, Yoda is trying to get Luke to focus on the present moment and to commit himself with his actions and intentions. I love this message, especially for Bennett as he matures. Win or lose, I hope he commits himself to his dreams and always remembers that good advice can come from many different places, even Star Wars. This drawing is made on 11x14 Strathmore Toned Tan Series 400 paper, with Koi Watercolor Pen, Prismacolor Colored Pencil, Micron Pen, and Gelly Roll Gel Pen.